Over the past two decades, coronary disease has become the leading cause of death in the United States. Smoking, obesity, diabetes, high blood pressure, high cholesterol and, more recently, high triglycerides have been linked directly to heart problems. What Is Cholesterol & Triglycerides? Cholesterol is essential to the manufacture of vitamin D, certain hormones, and the production of cell membranes. It is found in foods of animal origin such as meat, dairy products and eggs. Triglycerides are stored in fat cells and later released from fatty tissues when the body needs energy between meals. Both are lipids (fats) produced by the liver. Small amounts of these fats are necessary; only when their levels are elevated do they become unhealthy. Good health habits that include a balanced diet, exercise and weight control help maintain healthy levels of these fats. However, a healthy diet alone does not guarantee low or even normal levels for some individuals. 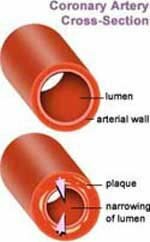 High blood cholesterol levels increase the likelihood that the fat will be deposited as plaque on the inner surface of arterial walls. As these deposits increase, the channel of the artery narrows contributing to an increase in blood pressure. To compensate, the heart must work harder to pump the same volume of blood through the narrower arteries. When the coronary arteries themselves are affected by plaque, the harder working heart receives less oxygen, thus increasing the risk of heart attack. Plaque also contributes to 'hardening' of the arteries or atherosclerosis. This loss of flexibility in arterial walls elevates blood pressure, putting the heart at additional risk for problems. Note: The above image was used with permission from the great "About Cholesterol Levels" web site. Elevated triglyceride levels are typical following high-fat meals. Lowering triglycerides is part of the body's normal response that results in a cyclical pattern of high - low - high - low. Elevated triglycerides are often associated with increased levels of LDL. For some individuals, elevated levels may pose a risk for heart problems. While the vast majority of causes of high triglycerides and blood cholesterol are not genetic, some cases may be due to a genetic disorder affecting liver function. Individuals who are diagnosed with particularly high levels of either of these fats should encourage genetically related family members to undergo testing for liver dysfunction. Of those individuals with high levels of these fats, an estimated one out of 500 has a genetic basis for their condition. Most of the causes of elevated triglycerides are acquired and include: a diet high in fat or carbohydrates (sugar), excessive habitual alcohol consumption, exogenous estrogens, poorly controlled diabetes, and the use of beta blocker drugs or corticosteroids. Women and diabetics are particularly at risk. Recent research suggests that a high carbohydrate diet, which raises blood sugar and insulin levels, results in greater production and storage of fat. This, in turn, promotes high triglycerides, which may indicate that LDL levels are too high, that HDL levels are too low, or that the HDL/LDL ratio ('good' to 'bad' cholesterol) is lower than normal. Research points to a possible correlation between elevated triglycerides and high blood pressure. Excess amounts of this fat increase the concentration of VLDL, which may contribute to plaque deposits, increased blood pressure, and heart problems. Lowering triglycerides is a step you can take to reduce the risk of both heart attack (coronary thrombosis) and atherosclerosis. If prolonged, elevated triglycerides may also result in pancreatitis. A condition that can cause malabsorption of nutrients, and could lead to diabetes. As pancreatitis progresses, damage can spread to other organs including the heart, lungs, and kidneys. Clearly, in addition to treating high cholesterol, lowering triglycerides is essential. If you have high cholesterol, set objectives for the short term and goals for the long term. Your objective should be to establish a program that includes a diet low in saturated fat and a regular exercise program to raise your fitness level and help reduce body fat. If necessary, medications can help you reach your objectives. Reducing blood cholesterol and triglycerides is key to reducing the risk of cardiovascular disease. Cardiovascular disease is a term that encompasses a number of conditions that affect the heart and the blood vessels. Narrowing and hardening of the arteries and high blood pressure are examples of such conditions. Your long term goals are to lower cholesterol, reduce body weight to target levels, and maintain them for life through dietary adjustments and regular exercise, if possible, without medication.